Founded in 2012, ParaZero specialises in the development of parachute systems for both manned and unmanned vehicles. And we’ve shown you some of their drone parachute technology a couple of years ago being tested on a 3DR Solo. Since then, ParaZero has gone on to produce a range of “SafeAir” parachutes for larger drone models, like the DJI Matrice 600 series. Now, though, they’re looking at a more mainstream audience, offering new SafeAir parachutes for DJI’s very popular Mavic Pro and Phantom series drones. The biggest benefit of this new model is that in the event the chute needs to be used, it can be repacked by the end user, and reused in the future. While you can use a drone to take shots and videos (either from the sky or from the ground), there are some alternative uses for it as well. 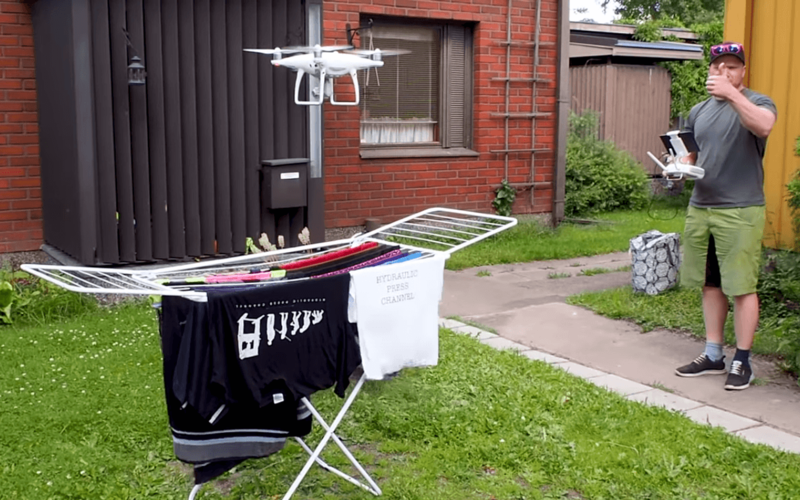 Lauri and Anni Vuohensilta, the couple you may know from the Hydraulic Press Channel, used their DJI Phantom Pro 4 to dry the laundry. On their other channel Beyond the Press, they published a video demonstrating how the airflow from the hovering DJI Phantom Pro 4 dries the laundry. In the end, they even tape wet boxers to the drone – but it turns out not to be the best idea. Shooting quality aerial video is the main reason that most people get a drone like the DJI Phantom 4 Pro. So, when your footage doesn’t look that great, it’s a bit of a disappointment. Often, though, the problem is simply down to not understanding how your drone works, and the different flight modes it offers. In this video, drone enthusiast Billy Kyle takes us to drone flight school to teach us all about the twelve intelligent flight modes offered by the Phantom 4 Pro. If you have a Phantom 4, Mavic Pro or earlier drone, it’s still worth having a watch. Even though all of the flight modes might not be available to you, the ones you do have access to are probably mentioned. It also serves as a good reference for what it can do if you’re considering buying, too. NASA has used computer models to simulate airflow for decades. It lets them test to see how aircraft will react to drag, friction and countless other forces. All important factors when it comes to designing the next generation of vehicles. At NASA’S Ames Research Center in Silicon Valley, the technique was recently used to check out the airflow around quadcopters. Specifically, the DJI Phantom 3. Unlike NASA’s typical rocket powered aircraft, quadcopters rely on four spinning motors with propellers to generate thrust. This thrust needs to generate enough lift to raise both the quadcopter and its payload (perhaps a gimbal and camera) off the ground. The simulations show just how complex the air motions are from the propellers, due to interactions with the X-shaped frame during flight. We’re always seeing new and creative ways that parents are using to inform friends and loved ones of a new addition to the family. But, I don’t think anyone does it quite like Dirk Dallas. 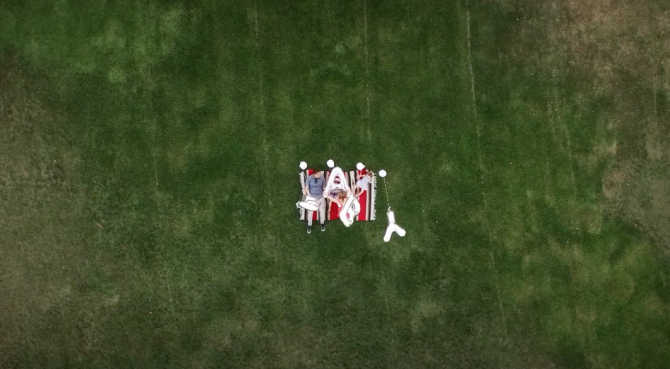 Dirk, a photographer and drone enthusiast with a flair for the dramatic (in only the best sense of the term), created a very memorable birth announcement for their third daughter using a drone in the backyard. Gear comes and gear goes. Or rather gear comes and gear accumulates. Photographer Mitch Bergsma have been shooting with a Gopro for 5 years and as one of his main tools of work, he had to fit it, mount it, strap it, elevate it and submerge it into various places. Having using a GoPro for five years means that you get to accumulate lots of mounts and cases for lots of different GoPro cameras and if in addition to that you don’t let go of the old gear, you get a full blanket of gear (sorry had to). So to celebrate this 5 years anniversary, Mitch got a DJI Phantom 2 in the air to take an aerial of all his GoPro gear. And there is a lot of it…. At the latest NAB we saw a big surge of Camera Drone interest. (it was sliders three years ago, Jibs two years, Gibmbals last year and now Drones). Most of the drones (or drone upgrades) introduced were focused on providing a smooth run or more range. Lily is a new players and it is focused on making it FUN. Lily is a camera drone aimed at extreme sports enthusiasts and as such it features some innovative features.